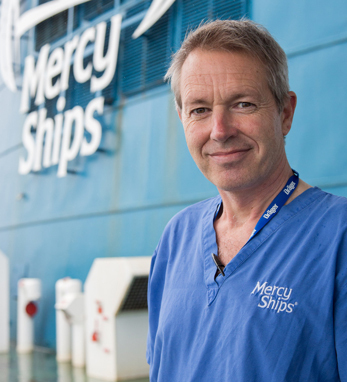 In September 2010, Michael McBrien discovered Mercy Ships at the Annual Scientific Meeting of the Association of Anaesthetists of Great Britain and Ireland in Harrogate, England, where he was presenting a talk. Eight months later he arrived in Freetown, Sierra Leone having undergone the online application process and received many vaccines. It was the beginning of a wonderful journey with Mercy Ships taking him to Togo, Congo Brazzaville, Madagascar (twice), Benin and Cameroon. McBrien has worked as a Consultant (Attending) Anaesthetist (Anesthesiologist) in the Royal Victoria Hospital since 1997, having qualified in medicine from Edinburgh University in 1988 with post graduate training in Edinburgh, Oxford, Perth (Western Australia) and Belfast. His professional skills and interests in adult and paediatric anesthesia, including difficult airway management, are ideal for the many difficult and challenging cases presented in his seven trips of two to three weeks each on board the Africa Mercy since 2011. His wife Irene, a pharmacist, has accompanied him on two of those trips in 2012 and 2017.